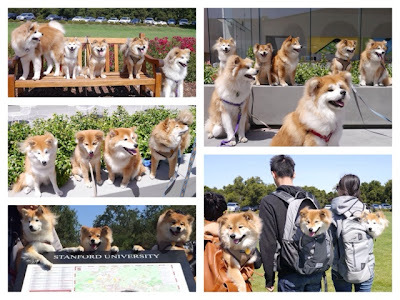 Over the past few months, we've been having fun going on walks, meetups, and parties. I started to learn what type of meetings works for her, what kind of dogs she likes, and what environment makes her feel more comfortable. Here are some highlights of her busy social life. 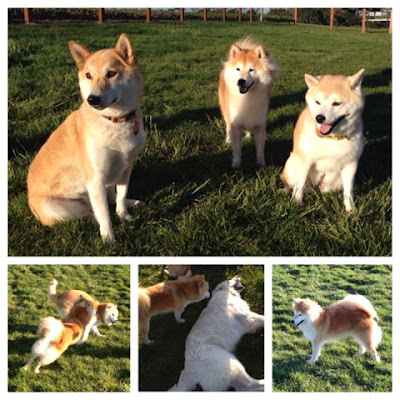 Weekly walks with Maya's BFF Tachi. Since we live close to each other, sometimes the moms will go out for an early evening walk during the weekdays. 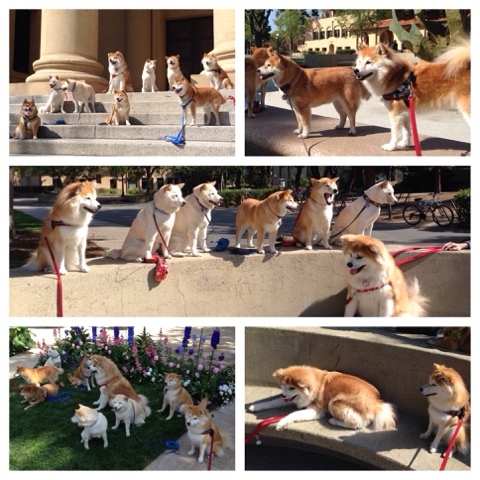 Taking over Stanford University with Shiba Inu and Akita friends. Zuko and Autumn also need some space on-leash, so we kept our distance and enjoyed the walk together. Once in a while we go into the dog park when it's less crowded. However, she rarely plays in there. She likes Caspian's company. He may be small in size, but he knows how to play rough! Maya has a weird relationship with 12 years old DonDon. The first time they met, Maya was still an annoying 4 month old puppy. She tried to jump on DonDon, and he gave her a firm "NO". Ever since then, Maya somehow just adores him and tried all her tricks to get him to play, but he pretty much just ignores her. 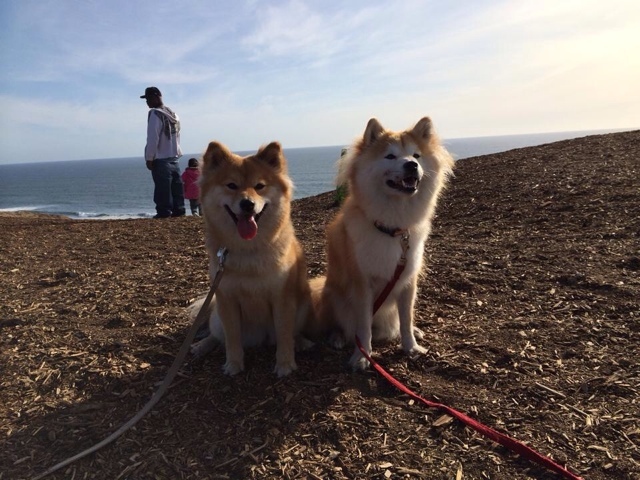 We also started to participate in a weekly Fort Funston Shiba walk group. This is a magical place for Maya. During one of our walks with Tachi, we also met Coconut. 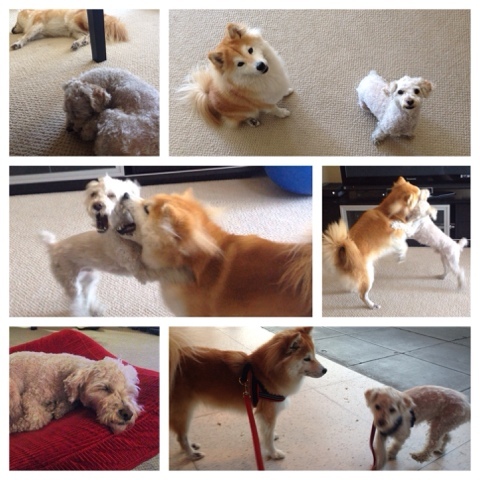 Coconut is a bit younger and too jumpy for Maya's liking, so she was growling at Coconut when they first met. After a long walk, they were doing great next to each other. 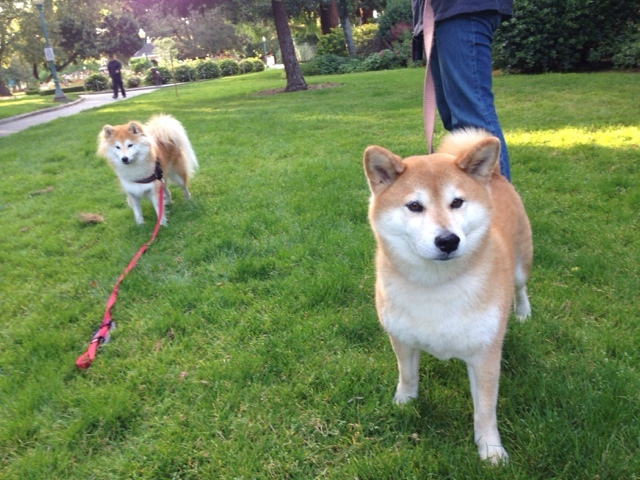 We were also happy to see another fluffy Shiba, Tira, at one of the meetups. 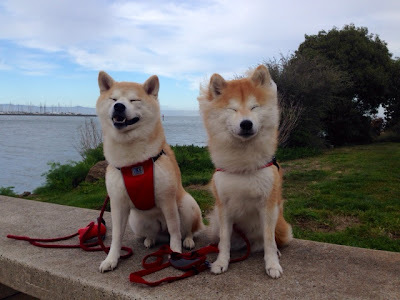 Occasionally, we run into another neighborhood Shiba, Musashi. I was a bit reluctant to let them meet on leash, but he was a good boy and left Maya alone when she growled. 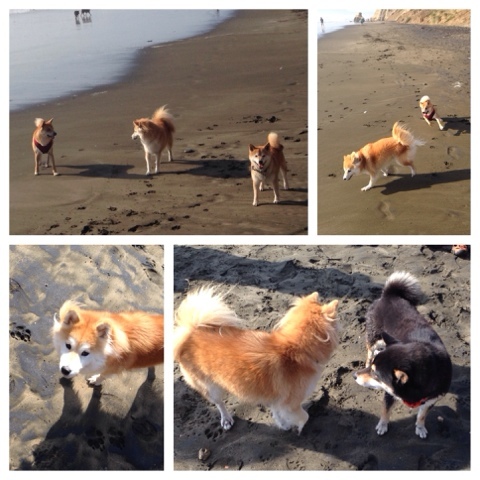 While I was talking to Musashi's owner, Maya started to sniff around with him, peacefully in the same space. 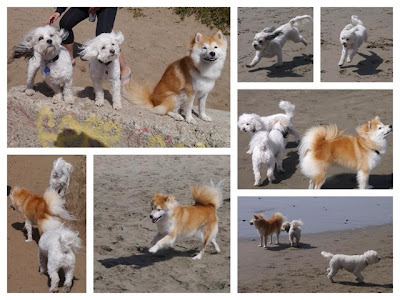 Ever since then, Maya's always excited and happy when we run into each other. I jokingly say that she has a secret crush on him! A very special meetup was with Actaeas and the Ti Family. Their owners live in Southern California, but also came from Taiwan. We "met" each other online via social media. 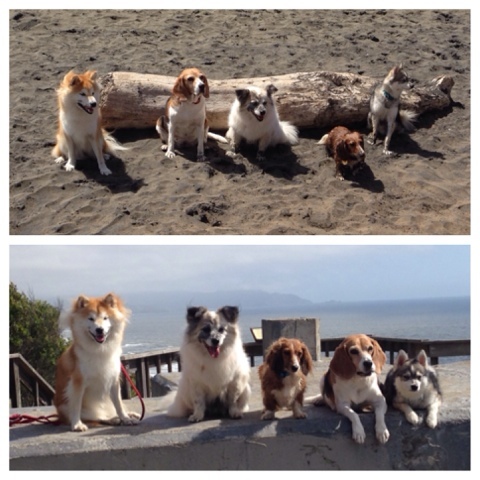 They came to the Bay Area for a weekend road trip, and we got to meet them at the beach. More awesome shots of the meetup can be found here and here. Another awesome meet, was with my junior high school friend, who brought her two dogs, Tumi and Poggi, from LA. We knew each other for a long long time, and I followed her doggie posts since they joined the family, but this was the first time I met them. Last but not least, we had a "long coat meetup" with 5 fluffy Shibas and 2 fluffy Akitas. Long coat in both breeds are due to recessive gene and a fault in the breed standards. 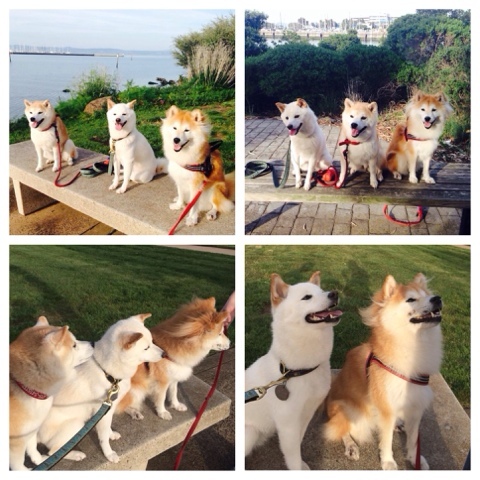 Nevertheless, they are great pets and super duper cute! There were groups of people taking pictures of them everywhere we went that day. I am a shy person in general. I usually feel uncomfortable meeting strangers, or hanging out with a big group of people I don't know well. I would never have imagined myself actively doing any of this. Because of Maya, I was able to meet lots of wonderful dogs and their humans. I hope she enjoyed the events as much as I did.